7, 2018. Cow skin, branches, seeds, roots, salt, earth, concrete nails, hemp 37 x 10 x 10 cm. On June 26, artist Tomas Diaz Cedeño will engage in a conversation with independent curator Verónica Flom. The artist, who is now a resident at RU, will discuss his most recent exhibitions and works. Díaz Cedeño’s sculptures and installations center on skin and the body. His practice deals with the appropriation of materials from marginal cultures and reflects on peripheral belief systems. Díaz Cedeño is interested in the way in which all these systems are mixed and superimposed, as well as the construction of fetishes and amulets that are products and consequences of these creeds. Tomas Diaz Cedeño is a Mexico City-based artist whose practice focuses on questions relating to the body, how the body is or how it can be represented. Díaz Cedeño probes the limits between objecthood and humankind by examining the expressive range material objects can embody when forced into previously unknown relationships in an obsessive artistic encounter. A case in point is a recent body of sculptures realized for his solo show at BWSMX in 2018. Although these works have a reflective quality they are not mirrors, but are intended to meaningfully reflect varied – and often repressed — human desires and fears. Formally, the sculptures are intended to evoke, frontally, the scale and presence of large human bodies; that the pigmented plaster of the sculptures suggests a white flesh is also no accident. The artist examines these questions through a delicate, tenuous–even grotesque–visual language rooted in a committed, intimate dialogue with the materials he uses. See exhibition history here. 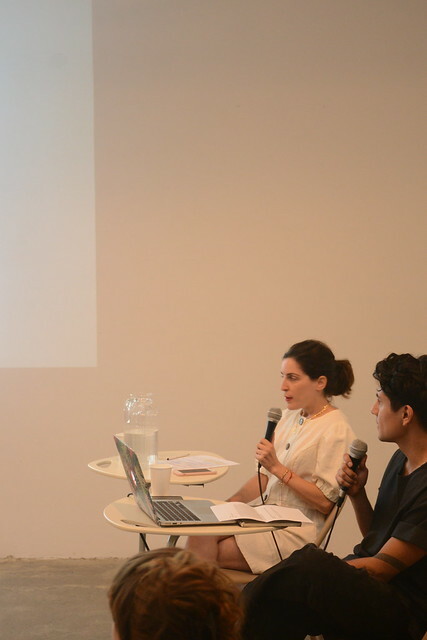 Verónica Flom is an Argentinian curator based in New York. She received an M.A. in Museum Studies at New York University. She is currently the Exhibitions and Public Programs Coordinator of Visual Arts at Americas Society, and previously worked at the Art Department of Universidad Torcuato Di Tella, in Buenos Aires. She co-authored the publication David Wojnarowiczand Luis Frangella in Argentina (2017) with Ian Erickson-Kery. This program is made possible with support from Peana Projects and Rockefeller Brothers Fund.